So a bike ride was in tall order. A meetup with Kent this morning after another week of weirdness was great but the high stress levels have taken a toll on the body. It will be incredibly nice once things settle down, which shouldn't be much longer now. The ride was short and really uneventful. 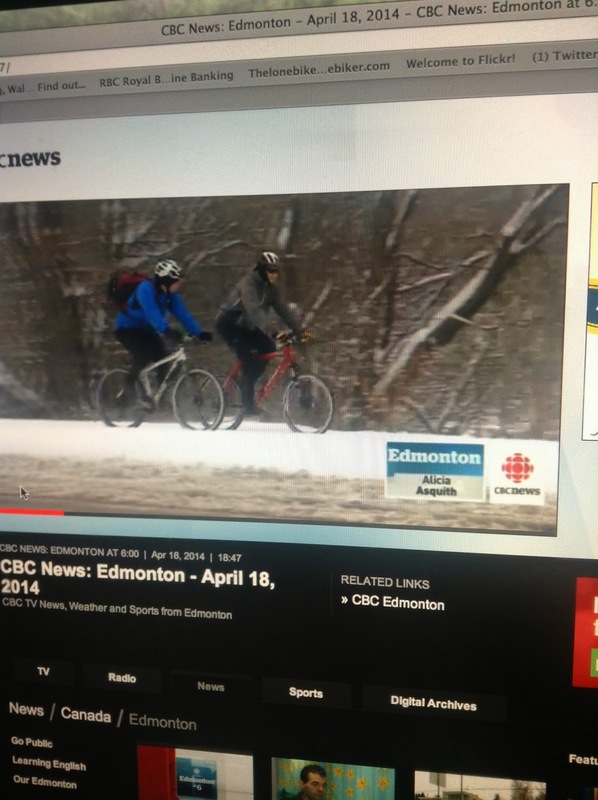 The highlight was being filmed by a CBC camera crew as we rode down river valley road. A mid ride break which lasted almost a half hour to discuss the future was had and we hit the trails again. The ride in the snow was great and the little singletrack riding we did do was smooth and delicious through the fresh snow. If you did get out for a ride today and were ready to ride I'm sure the conditions would have made it epic. Or maybe that's just how I think. I'm surprised they didn't have a graphic come up saying "THAT'S THE LONE BIKER AND SOME LUCKY GUY!"